√ Different Types of Forex Trading Platforms, Which the Best ? All of a sudden a new forex trader cannot just go online and buy and sell currencies. This is because of the virtual nature of the currency market. The only way in which a trader can place a trade is by opening an account with a forex broker or platform provider and receiving login details from the broker so that the trader can access the platform for trading. Here, on the platform, currency pairs can be freely traded by traders. There are different types and versions of trading platforms that are available today. There may also be differences in the platforms offered by different brokers. It is, therefore, very important that traders are aware of such differences. This is because it has been observed that the type of platform ultimately has an effect on the result that comes out of the trade. There are many factors that decide how a forex trading platform is classified. Read on to know more about the different types of forex trading platforms. According to the format, trading platforms can be divided into Downloadable or Non-Downloadable versions. The online non-downloadable version is web based or otherwise the platform exists as a downloadable software package. The online web-based platforms run using Java. The trader accesses the platforms by typing in the URL name in the browser. He/she then has to feed in specific login details to access his/her personal trading account. This has the advantage that the platform can be accessed from anywhere. The traders need not carry their personal computers or hand-held devices where the platform is stored. In the case of the downloadable version, the software is stored on a specific device. They are available as a set of executable files which have to be run on that device every time the platform needs to be accessed. Platforms that are classified according to the programming language used also come in different types. The MetaTrader platform, of which the MT4 and MT5 versions are available, has been designed with the Metaquotes Language (MQL). ActTrader is another one that has been created out of the ActFX language. Other platforms are TradeStation designed with Lua, Currenex, and cTrader. MetaTrader: Designed by MetaQuotes Inc., this is one of the most widely used currency trading platforms. Version MT4 is particularly popular. Most successful and popular forex brokers are known to offer MT4 as their trading platform. The platform is easy to navigate and very user friendly. Both these factors contribute a great deal to its popularity. MetaTrader 4 (MT4) : It is a popular trading platform that allows for very fast execution of trades. It is possible to execute one-click trading from charts. It also allows to back-test strategies. In addition, it allows for automated trading with EAs (Expert Advisors). MT5 : MetaTrader version 5 is the latest version of the platform. The appearance of the interface is the same but is blessed with more capabilities. However, the transition is made easier for the traders because of the same appearance. The technology is more comprehensive in this version. There are more inbuilt tools such as indicators and charts. The system allows for importing trade signals from the MetaTrader social community. ActTRader : A product of ActForex Ltd., it is used by brokers such as AvaFX. The way in which this platform works is widely different from MT4. This platform has both the web-based and software downloadable versions. The layout of the platform and the manner in which trades are placed are both different from the way in which MT4 and MT5 work. TradeStation : Some of the brokers that use the TradeStation platform include Interbank FX and Forex Capital Markets Ltd. It has been designed by TradeStation Technologies Inc., using the Lua programming language. Advanced Trader : Created by Swissquote, this software is an award winner and is designed to meet the needs of beginner traders who want to go professional. The user interface is friendly and easy. This makes navigation simple and the platform is easy to use. The latform can additionally handle all advanced order types. There are many charting tools that is of help to the beginner trader. The user can switch easily between desktop, mobile and web versions. Currenex : This trading platform is available in two versions. The Currenex Classic platform is a dealing desk platform. The Currenex Viking version is an ECN (electronic communications network) platform that suits experienced traders. The first version operates better in market maker kind of situations. 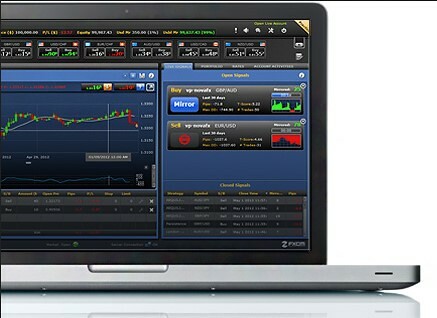 The Viking version’s interface is slightly more difficult for the trader to navigate and is best suited for professionals. The Classic version has many charts and tools that would help a beginner trader to learn the subject without many hassles. It is easier to use. cTrader : cTRader is an ECN platform that allows the traders to directly access the currency markets. Spotware Systems Ltd. is the creator of this platform. Another product of the company is cAlgo which allows algorithmic trading. In this case, platforms are classified on the basis of trading model that the forex broker operates on. The two categories are Dealing Desk platforms and ECN or Direct market Access platforms. Dealing-Desk Platforms: Typically, such platforms are offered by forex brokers that want to operate as market makers. The platform is connected to the broker’s dealing desk and all transactions/trades must necessarily pass through the desk. All prices emanate from the dealing desk of the broker. Some examples are Metatrader, Currenex Classic, ActTrader and TradeStation platforms. ECN Platforms: These are generally referred to as Non-Dealing Desk platforms. The pricing is not from the dealer’s desk but from many liquidity providers. All the prices are displayed on the terminal and the traders can choose the price that suits their trading model the best. They give the trader direct access to the money markets. Examples of ECN platforms include Currenex Viking, cAlgo, and cTrader, among others, and are generally used by large financial institutions.